"You want me to test these where? That's right, test 1 to 2" from the edge of the pan. Why? By the time the center is completely set, the edges will be dry. Look for very moist crumbs if you must test in the center!" 1) Heat oven to 300F. Lightly grease an 11x17" baking pan. Cover the bottom of the pan with a piece of parchment paper cut to fit. Lightly grease the parchment paper. 3) Remove top of double boiler from heat, and carefully wipe bottom (so none of the moisture steams up into the chocolate mixture); cool slightly. Whisk in the butter to blend. 4) In a medium bowl with an electric mixer, beat the eggs, sugar, and vanilla on low speed until combined. 5) Add the cooled chocolate mixture to the egg mixture. Gently add in flour and salt just until mixture is combined. Spread into prepared pan. Bake for 15 to 20 minutes or until a cake tester or toothpick comes out with a few moist crumbs attached, testing 1 to 2" from the edge of the pan. Cool pan completely on a wire rack. 1) Bring the cream to a boil in a medium saucepan. Remove from the heat and whisk in the chocolate. When the brownies have thoroughly cooled, invert the pan over a wire rack placed atop waxed paper. Remove the parchment paper. 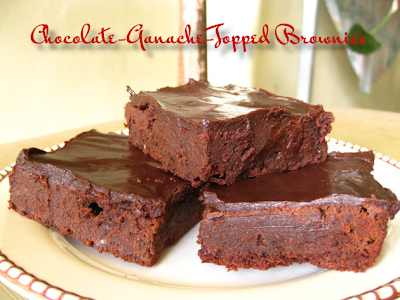 Spread the ganache evenly over the brownies. Place brownies in the refrigerator to set. Cut into bars once cooled and ganache has firmed slightly.